John Harris after James Pollard. This exuberant scene is one of a series that Harris produced in collaboration with Pollard entitled Scenes on the Road or a Trip to Epsom and back. 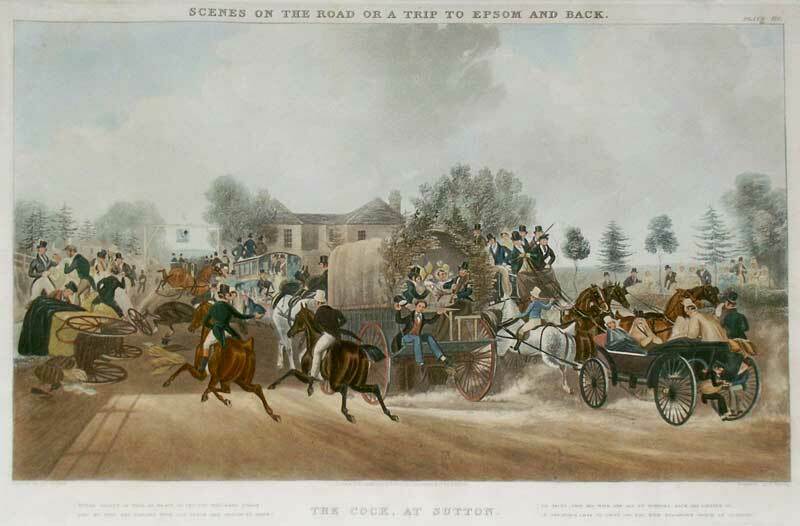 With great humour and attention to detail it depicts an early scene of road congestion outside one of the popular coaching inns on the road out to Epsom in Surrey. In this humorous scene we get a clear sense of how busy the artery roads in and out of London were in the days before more stringent traffic regulation came into force. The pervading impression is that life on the highways was something of a free-for-all and we see passengers on board the omnibus looking askance as a carriage overturns and causes the horses to bolt. In another carriage a man plays with his fiddle whilst two cheeky boys grab a free ride.